The Queen attended the Royal Windsor Horse Show (May 8-12) on various days. 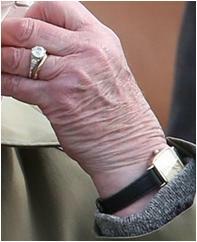 The horse show is usually a time for the Queen on casual duty - a single strand of pearls peeking out from under her headscarf and coat, with her rings and casual watch - but there are glimpses of the duty uniform. This year, an emerald and an amethyst came out to play.